Classic Dental Smiles > Frequently Asked Questions (FAQs) > Dental Implants > What is a dental implant? A dental implant is a titanium post that is placed into the jawbone beneath the gums and serves as the foundation for a dental crown to sit on. It is the best replacement for a missing tooth or multiple teeth. 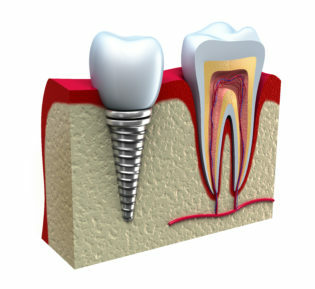 Dental implants can also be used to anchor a partial or full denture. They come in various shapes and sizes so it is critical that we get all the proper diagnostic information to properly plan the appropriate implant for the empty space.